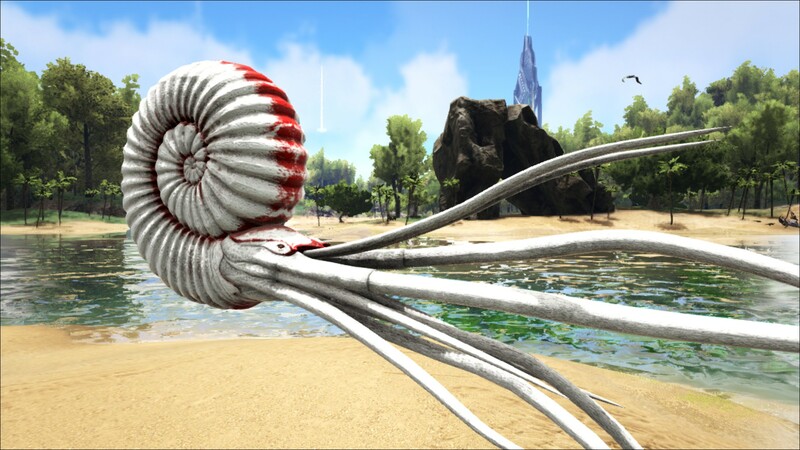 The Ammonite is one of the Creatures in ARK: Survival Evolved. Usually found in the deepest parts of the water around the island, Amonitina multiamicus has a strange relationship with the other creatures of the deep. It must do something beneficial for them since every nearby sea creature defends Ammonitina when it is attacked. What this distinct symbiosis is based on, alas, I have not yet discovered. Ammonitina has also made its way into the deeper parts of many underwater caves. Even within these caves, the creature will draw attention if assaulted, making harvesting its resource-rich shell a tricky proposition, depending on what other dangers may be lurking nearby. Like many of the untameable ocean dwellers, Ammonitina still has enough utility to be a valuable hunting target. If a tribe is willing to risk the wrath of nearby would-be protectors, Ammonitina bile can be harvested from the innards of its corpse. This bile can then be worked over with other chemicals to produce powerful concoctions, the most notable being a mixture that causes creatures to become enraged and attack the source of the scent. 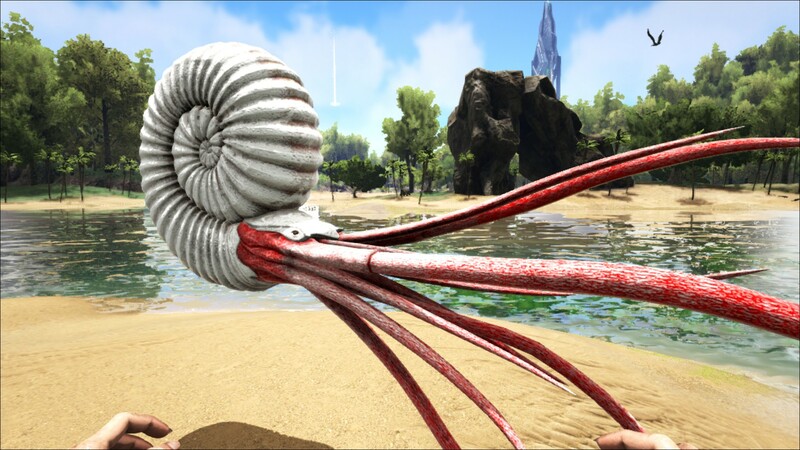 Unlike the majority of animals in the ocean, the Ammonite is a passive animal that won't fight back. However, when attacked, it will release a green, inky substance into the water, causing all wild animals nearby to become aggressive; including nearby land animals. The Ammonite resembles a nautilus, but much bigger, comparable in size to some of the largest of fossil species. This section displays the Ammonite's natural colors and regions. For demonstration, the regions below are colored red over an albino Ammonite. The colored squares shown underneath each region's description are the colors that the Ammonite will randomly spawn with to provide an overall range of its natural color scheme. Hover your cursor over a color to display its name and ID. For example, "cheat SetTargetDinoColor 0 6" would color the Ammonite's "shell" magenta. 5The Ammonite is incapable of drowning. 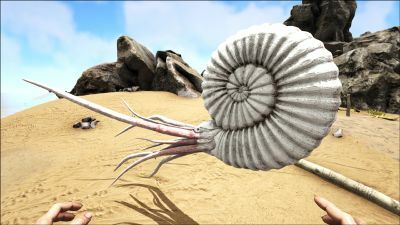 Upon being threatened, the Ammonite releases a pheromone that causes all nearby wild creatures to become aggressive toward its attacker. This section describes how to fight against the Ammonite. 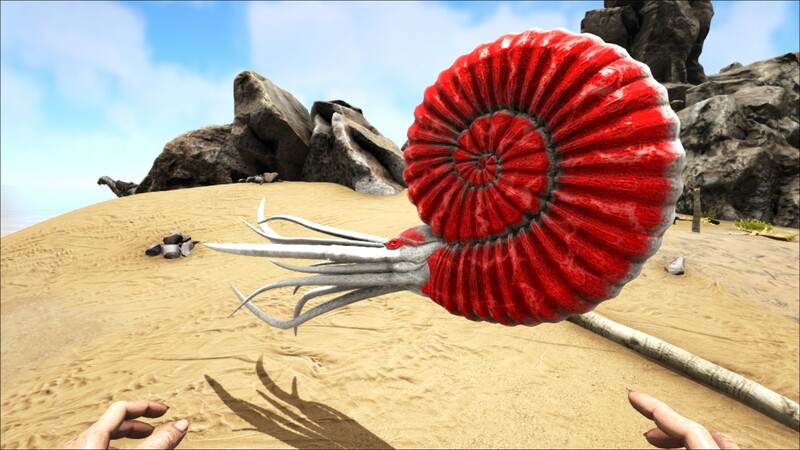 The Ammonite is a non-aggressive animal that will not attack the player on sight. The shell of the Ammonite is tough and resilient against most weapons. Therefore, players should target the tentacled head, which is vulnerable to damage. A Pike is the best used for close quarters, as the weak area is quite small and hard to aim with a crossbow or rifle. It is also recommended to kill all wild animals nearby, as these will become hostile when you attack the Ammonites. The Ammonite itself is not a danger, however, when attacked it will release a green substance into the waters, causing nearby wildlife to become aggressive for a whole minute. An Ammonite hunt can quickly become overwhelmed by masses of normally passive animals. Also, the underwater caverns and depths Ammonites dwell in have their own dangers, such as mass shoals of Cnidaria, as well as many other terrors of the deep. The Ammonite will not fight back in any way, making for a rather easy kill so long as there are no other animals nearby. The name Ammonitina multiamicus is most likely a reference to its behaviour. Multi is the word used to describe anything of number, greater than one. Amicus being the Latin word for "friend", his name would roughly translate to "Ammonite with multiple friends". This is most likely a reference to this species aggravating all nearby creatures (its "friends") onto the attacking player. The top right image in the dossier appears to have an Arthropluera. Contrary to popular belief, they are not only found in caves. Similar to eurypterids, clusters of ammonites can be seen on the seafloor in various parts of the map, such as the South-West corner. Some have been seen past the giant rock spires of the south. Ammonitina is not a real genus name, but rather the name of a suborder of ammonites. The ammonite depicted in Ark is very similar to Parapuzosia seppenradensis in size; if this is the true identity of the ammonite seen in the game, its true scientific name would be Parapuzosia multiamicus. This page was last edited on 31 March 2019, at 21:54.